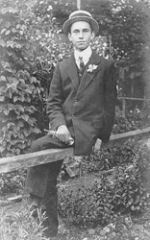 Sergeant Reginald (“Jack”) Evans DCM | The Dacorum Heritage Trust Ltd. 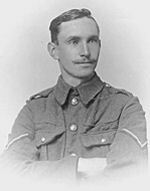 Recently, the Dacorum Heritage Trust purchased some First World War medals, including a Distinguished Conduct Medal with bar, awarded to Corporal Francis Vercoe, Royal Garrison Artillery, of Hemel Hempstead. We wrote in our newsletter and “The Gazette” at the time that Vercoe was the second man from the town to be awarded the Distinguished Conduct Medal (DCM) and that the first recipient was Sergeant Reginald Evans, who worked for Kent’s Brushes of Apsley. Some time later, this article found its way to Reg’s daughter, Pamela Campbell who now lives in France and she recently donated her father’s medals and papers (including copies of all his letters home) to the Trust. This is Reg’s story…. 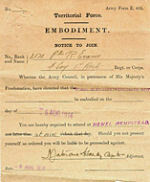 Reginald Josiah Thomas Evans was born in January 1888, a month after his father died. He was educated at the Spurgeon Orphanage in London and then served an apprenticeship as a wood borer at the Gade Brush Factory of GB Kent and Son Ltd., Apsley. He lived with his mother and brothers in Broad Street, Hemel Hempstead. 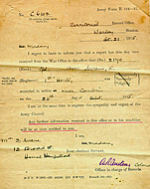 He joined the Herts Territorials in 1913 and he was with them at camp in August the following year, when war was declared. Offical notice of Jack’s wounding. 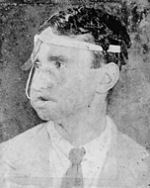 Jack’s face being rebuilt in hospital. So Reg was the first man from Hemel Hempstead to join up. Reg (Jack) as a Home Guard. 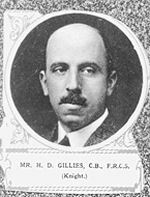 The following year, in February 1916, Reg was badly wounded in the face and underwent pioneering plastic surgery performed by Captain (later Sir) Harold Gillies at Britain’s first plastic unit set up in the Cambridge Hospital, Aldershot. 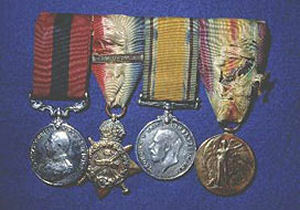 He later joined the Royal Sussex Regiment and took part in the British Expeditionary Force’s campaign in Russia against Lenin’s Bolsheviks of 1918-1919. 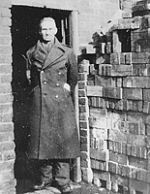 After the war, Reg found it difficult to resume his civilian life back in Hemel Hempstead and went to live in Armitage, Staffordshire, from where his mother originated. He married Eva Walker in 1924 and they had four children – Bill, Mary, Pamela and another son who died as an infant. He ran a newsagents in Armitage and also served as parish clerk, Secretary of The British Legion and was in the Home Guard during the Second World War. He died in 1943 and is buried in Armitage Churchyard. A truly remarkable man.